Is Your Sandwich a Winner? Now through October 11, 2012, children ages 6-11 can enter a unique contest for cash prizes. The JIF Most Creative Sandwich Contest is looking for recipes that use peanut butter or hazelnut spread in them. Other than that, you can use your imagination and go “nuts” with creativity. Chicken PB Wrap? PB with Pickles and Olives? YOU get to decide what makes up the most creative sandwich. I’d love to hear some of your creations and will post some pictures if you send them to me. The other site is a blog of one of my followers, Karen Drummond. Karen is a teacher and lover of Children’s Literature. Her site has picture book reviews, lesson plans and activities to tie into the stories. Two featured titles are: ARE YOU A HORSE? by Andy Rush, and WHERE IS THE GREEN SHEEP? by Mem Fox. Many of her postings are a perfect resource for home school parents looking for interesting, kid-friendly stories to enhance the curriculum. Karen also provides link to other web sites. There is a wealth of information on this attractive, well managed site. Here is an invaluable site that lists hundreds of links to resources for crafting, publishing and marketing books for young readers. http://www.resourcesforchildrenswriters.com. I especially love the huge array of links all on one site so you can explore so many topics from one page. Coming up on Friday’s post: Healthy snack/lunch options for back to school. Whether you are a home-school-er, teacher, or a parent looking for opportunities for enriching your young child’s education, try these websites for a wealth of ideas. All are free. 4. Foundation for Early Learning: earlylearning.org/resources/publications/getting-school-ready? Also, a wonderful book to help young children transition into Kindergarten is: IS YOUR BUFFALO READY FOR KINDERGARTEN by Audrey Vernick. Its gentle humor helps young children deal with the unknowns of starting school. 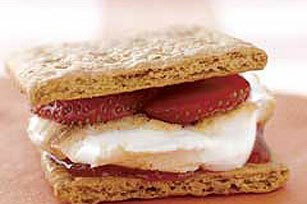 Gather around the campfire or barbeque grill and celebrate NATIONAL S’MORES DAY on August 10. You can make the traditional version with graham crackers, chocolate and marshmallows, or be creative and try new versions of the sweet treat. Visit dashrecipes.com/smores for tons of inspired recipes from all over the internet, using waffles, cones, cookies. There are a few that require no fire at all as well as vegan selections. I’d love to hear your favorite recipe and will post it here if you send a photo. 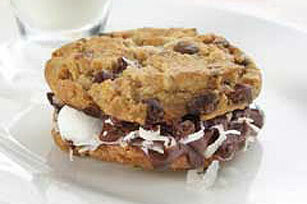 Here is one recipe using chocolate chip cookies and coconut in addition to the regular ingredients. This one below uses sliced strawberries with the toasted marshmallows and chocolate. Who knew there were so many versions? I recently came upon an amazing website called SQUIDOO. This site lets you share your wisdom, ideas, and expertise on a wide range of topics. It also lets you surf the site for information on everything from games/crafts/hobbies, health, gardening, video games, to parenting, books/poetry/and writing. It’s easy to spend hours browsing the categories and mining the gems contained within. Pay SQUIDOO a visit…I think you’ll find something worthwhile.